Bringing movie magic right into your home, this 3-person theater seating group features chaise styling, built-in cupholders, optional LED cup and groundlighting, as well as optional tray tables and a buttkicker system. 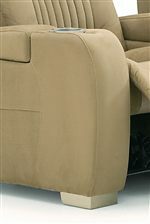 Its wedge arms form a slight curve for ultimate TV viewing no matter where you sit, while sinuous wire springs and high-resiliency seat foam provide head-to-toe cushion and support. The ultimate seating for your home entertainment area, this theater group has everything you need for movie marathons and more. Available in manual and power. Multiple configurations available. 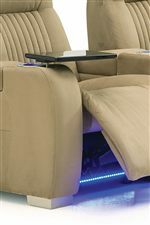 The Autobahn Contemporary Power 3-Piece Theater Seating with Cupholders at Rotmans in the Worcester, Boston, MA, Providence, RI, and New England area. Product availability may vary. Contact us for the most current availability on this product. 46954-5E LHF Arm, RHF Wedge, Power Recliner 1 45" 39" 41"
46954-7E RHF Wedge, Power Recliner 1 37" 39" 41"
46954-3E RHF Arm, Power Recliner 1 30" 39" 41"
Fabric Options 85 luxurious leathers and over 200 fabrics are available in every color under the sun, including coordinated accent patterns. Pricing and availability may vary. For theater seating at its best, try the Autobahn home theater group. With multiple configurations available in both manual and power recline, you are sure to find the seating that is right for you and your family. Optional features include LED cup and groundlighting, tray tables, a buttkicker system and a wood or aluminum foot. 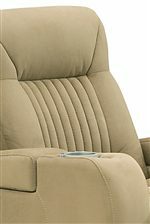 In addition, chaise-style seating complete with sinuous wire spring technology and high-density seat foam creates lasting comfort from head to toe. Where style is also key, a contemporary look is exuded from track arms, block feet and tightly tufted channels on center backs. 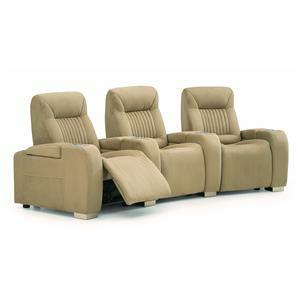 Bring movie magic right into your home with the Autobahn theater seating group. The Autobahn collection is a great option if you are looking for Contemporary furniture in the Worcester, Boston, MA, Providence, RI, and New England area. Browse other items in the Autobahn collection from Rotmans in the Worcester, Boston, MA, Providence, RI, and New England area.